You know you need 72 hours worth of food and water in your bug out bag. You also understand you should have some type of emergency communications device, some cash, and some standard of personal defense. A flashlight and some way to start fire are also crucial items to have in an emergency situation. But the following items, though they could be essential to saving your life, are not usually added to a bug out bag. Add these 9 survival items to your BOB today, and they may just save your life tomorrow. They are more expensive than standard batteries. But when did you place those alkaline batteries in your bug out bag anyway? Do you remember? How do you know they are any good? How long will they last? Purchasing a solar powered battery charger and several rechargeable batteries ensures that you have power for all of your survival gear, as long as you have sunlight. Learn more about emergency solar powered gear. Cotton balls have obvious advantages for first aid treatment. They can also be soaked in vaseline and stored in your bug out bag, making an excellent fire starter. They take up very little space and weight next to nothing. You may think that since you have water in your Get Out Of Dodge (GOOD) bag, there is no need for purification tablets. But things do not always go as planned. Like cotton balls, water purification tablets make almost no weight or storage impact in your bag. Roughly zero space and weight is taken up by a few resealable bags in your BOB. The versatility of simple plastic, sealable bags means a laundry list of possible uses in an emergency situation. A hand powered can opener which also opens bottles should be in your bug out bag. Even if the food you have packed does not require a can opener, what if your situation stretches into days, weeks or months? Being able to open any can you run across could save your life. Wild plants can only fill you up so much. They also do not supply much energy as opposed to meat. Snare wire can obviously be used for setting wild game traps. But that same wire can also fill a lot of non-hunting fastening and tying roles as well. Just like snare wire, fishing line is strong and resilient and can be used in a number of ways in a disaster scenario. Place 15 to 25 feet of line, a few hooks and a couple of split shot sinkers in your survival fishing kit and you are good to go. 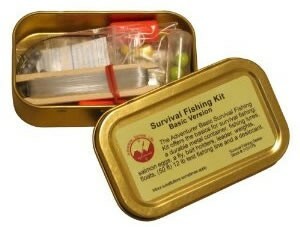 Most survival fishing kits are under $20 and are compact for easy inclusion in your BOB, or its really easy to also create an inexpensive DIY fishing kit using an empty Altoids box for storage and piecing together the components. This might be one of the most versatile pieces of disaster survival gear there is. But for some reason, it is often overlooked when building bug out bags. An ax can be used for hunting or self-defense, cutting wood, opening cans, as a hammer and a knife blade, and even an emergency signal by reflecting light off the blade. There are even special survival axes made with fishing kits, compasses and other survival items in the handle. A tarp can be used to build a shelter, as a signaling device, for camouflage, as a ground cover base for a tent and even as a cover or wrap to retain body heat. Strips can be cut from a tarp to serve as lengths of rope for multiple uses.